What a gorgeous bounty of food. Yesterday morning, my husband and I made our way to the park to join the wandering masses making their way through farmers’ booths, bakery stands, and stalls of homemade goods. I picked out most of the produce we will eat this week. We already had an avocado, red potatoes, limes, lemons, squash, sweet potatoes, a bit of lettuce, and a tomato at home. As you can see above, I purchased lavender, peaches, cabbage, leeks, lettuce (oh my goodness, one of the best local purchases you can make), asparagus, radishes, broccoli, blueberries, beets, carrots, cucumbers, and blackberries. I also bought a cup of cool mint tea to sip as we shopped, a wedge of cheese for our next wine party (each person contributes money to attend), and four cilantro plants. The total came to $59. One of the farmers was late to the market; he said it was because they’d only finished picking the vegetables an hour earlier. Another had blackberry stains on her fingers from just plucking the berries we purchased from her. One of the farmers’ teenage sons, who was running his family’s booth, gave us a discount “because you’re here every week.” I had a conversation with another farmer about how I’d taken to roasting radishes, which mellows their pungency with sweetness. He asked for details on my process so that he could go home and try it. When I complimented one of the farmers on how well the hydrangea he’d given us the previous week had held up and suggested that he tell potential customers I’d said so, he insisted I take more hydrangeas home this week as a gift. How long were we there? I couldn’t tell you. Thirty minutes? An hour? It was so pleasant shopping under the shade of the breeze-tickled trees, warm sun peeking through at intervals, babies napping in strollers or watching the many leashed dogs trotting through beside their owners. I had no desire to hurry it up, to try to be efficient as I often do making my way through the grocery store, hugging myself to keep warm. 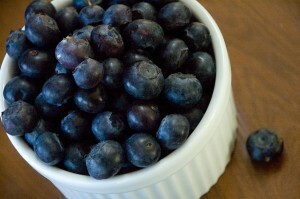 When we got home, I sat down and ate half the blueberries while chatting with my husband. The berries were so ripe and lovely, giving way in my mouth with each sweet bite. When I stop to think about it, I am so amazed at the beauty and diversity of what air, soil, water, sunlight, and a little seed can create—often with the hard work of a farmer, of course, especially a farmer who isn’t using chemical fertilizers or pesticides to keep the plants healthy. But just the sheer variety of what edible plants exist on this planet, or even in my area—it’s wondrous. The food is put away now. Dan is outside potting the cilantro as I type. The hydrangea are tucked in a cobalt blue glass on the table. 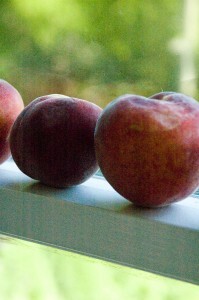 The peaches sit in the windowsill, where they’ll finish ripening. I just need to plan our meals for the week now, to make grateful, celebratory, and health-giving use of this abundance of local foods. 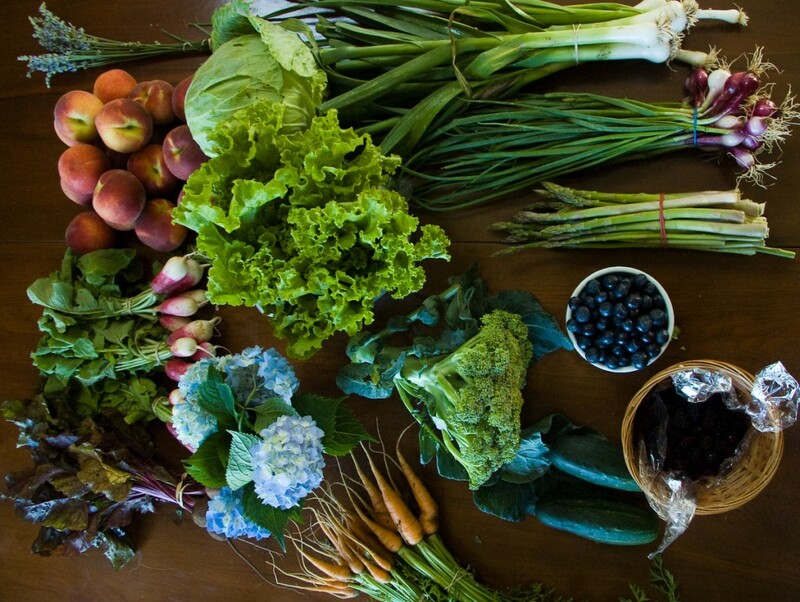 What a beautiful farmer’s market basket of food you have! I can’t wait for produce to be available – I live in Minnesota and we are just starting to see the first of very very early spring produce at the markets. But by mid-June, we shoudl have more! Your post is making me excited for the bounty that is to come, both from the farmers and from my own modest plot of garden. Thanks for the tasty, juicy, delicious photo! Fresh cilantro really is one of my very favorite things in the whole wide world. You can so many very yummy things with it. I make a killer lemon-cilantro chicken, if i do say so myself. Farm fresh food is so very joyous. I cannot wait until I’m able to grow much of my own food. Oh yummy. Our big farmer’s market has changed somewhat over the past 4-5 years, allowing in things that have never touched soil let alone grown anywhere near here. Some vendors sell bananas (I am in Iowa) and some still have the stickers from the wholesaler on them. I rarely go anymore. Also because it is SO very crowded. Rather than people getting goodies from the farmers, it is now THE place to be seen -even at 7 in morning. The smaller markets make me more happy. And I love to go down to my mom’s to one of her nearby markets which has such a lovely supply. I am growing spinach for the first time in my little garden area and hope it turns out. Carma—Blog post on roasting to come soon . . . as a guest post on another blog, actually. But I’ll talk about it there and will definitely link up! Glad you love the markets like I do. They are such a blessing. That bounty does like beautiful and now I will have to try the local farmers’ market next Saturday. I love roasted vegetables and pineapple so can’t wait to read your post on this subject. Beautiful photo!!!!! I would love to hang a photo like that in my kitchen. Inspiring and mouth-watering. Lovely! We got our first CSA share yesterday. I was so excited that I literally kissed the vegetables (well, I air kissed them, since they weren’t washed yet). 🙂 We’ve already visited a lovely little farmers’ market about 10 minutes from us, and there’s another one just around the corner that opens tomorrow. I love, love, love it all! I recently read on a blog that wine is not gluten free. Do you drink wine? I was drinking it but now I realize that many times I did not feel well were related to alcoholic beverages that were not gluten free. Local peaches and blackberries already?! I’m jealous! We’re still at the beginning of strawberry season in Indiana. I’m waiting a couple of weeks because the first ones were bland due to too much rain. My blackberries are just setting on. The vines looked like white rose bushes when they bloomed. My recent harvests have been asparagus, snow peas, lettuce and rhubarb. Lynn—While occasionally a particular type of wine is stored in a barrel that’s been sealed with flour paste, most wines are not. Most wines are gluten-free. Most alcohol is gluten-free, actually. There’s a variety of lists on the web about this—celiac.com has a good one. However, you can have a reaction to wine or other alcohol for a variety of other reasons—other allergies, an intolerance to yeast, a reaction to the acidity, a problem with sulfites, etc. If you find alcohol inevitably makes you feel bad, there’s every reason to give it up, but if all alcohol makes you feel bad, gluten shouldn’t be the culprit. Thank you for the clarification. I seem to have lost my taste for alcohol and it does seem that I have developed some sensitivities in addition to gluten which I have not been able to pinpoint yet. I do have seasonal allergies and have been getting a lot of headaches as well. I’m a work in progress! For what it’s worth, when your body is overloaded by additional histamines (from the time of year when seasonal allergies are worse; or from stress, or illness), you are more likely to react to things that might give you no reaction or a low-level reaction at other times of the year. I went to the doctor today and she said I had migraines! One week of suffering! She also said my gastritis was acting up. Back to the medicine for that one. Unfortunately, the allergist says to avoid berries and perfume when allergies are bad but since I get shots my allergies don’t seem to be a problem. But I may have to switch my one cup of Starbucks macchiato to decaf. Is decaf ok?